The Tipu Sultan summer palace was built in 1791 and was was one of Tipu's favourite summer retreats. It is a beautiful two-storeyed ornate wooden structure with exquisitely carved pillars, arches and balconies. The Nandi temple is located in Basavanagudi, a district of Bangalore. It was built in 1537 by Kempe Gowda, a local ruler in the Vijayanagara empire. The main shrine houses an idol in the shape of a bull. Another Hindu temple in Bangalore is the ISKCON (International Society for Krishna Consciousness) one on 'Hare Krishna hill'. 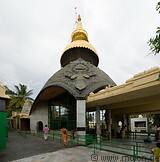 This temple is a striking blend of traditional and modern architecture. 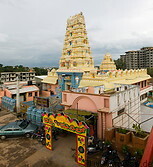 Opposite the ISKCON temple lies the colourful Ashta Lakshmi Hindu temple. On a nearby hill lies the Sri Prasanna Veeranjaneya Hindu temple.